Becoming a member of the Huver I. 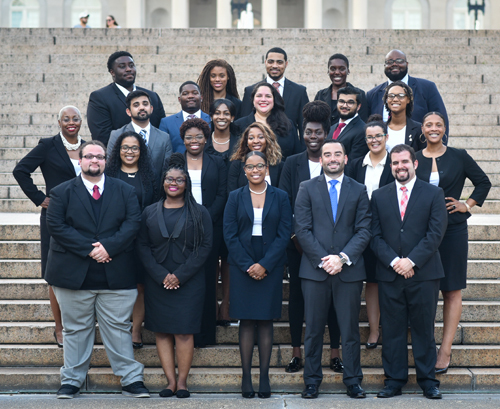 Brown Trial Advocacy Team is one of the highest honors a Howard law student can earn. With membership comes a great deal of responsibility. The team is named after Huver I. Brown, an African-American attorney who in 1939 sued the District of Columbia Bar Association to gain access to the District of Columbia Bar Association Law Library. During a trial, the presiding judge asked Attorney Brown to provide legal support for an argument he made. Because at that time only white attorneys were allowed to use the law library, African-American attorneys had to argue “from the seat of their pants” without the aid of legal precedent. Attorney Brown was refused access to the library, and sued asserting that a private bar group could not deny black lawyers access to the law library because it was located in a federal courthouse. Therefore the denial of access was unconstitutional. In 1941, the lawsuit was settled, and African-Americans were allowed to use the law library, contingent upon payment of a fee. The Trial Advocacy Team shall be comprised of not more than twenty team members at any given time; however, the Faculty Advisor reserves the right to increase or decrease the standard number of members at his/her own discretion. If the Faculty Advisor does increase the number of members, any additions to the team may not exceed 23 members. New team members shall be selected during the annual spring Trial Advocacy Team Competition. This is a rigorous interscholastic competition open to all first and second year students in good academic standing at the Law School. The Team shall be governed by the officers of the Executive Board. The Executive Board shall be comprised of the President, Vice-President, Captain, and Co-Captain and Business Manager.